China’s first domestically built flattop could be commissioned as early as April. The Chinese People’s Liberation Army Navy’s (PLAN) first domestically designed and built aircraft carrier, the Type 002 (CV-17), which has yet to be named, returned from a fourth round of sea trials in the Yellow Sea to the Dalian Shipbuilding Industry Company (DSIC) shipyard, located in the port of Dalian in China’s Liaoning province, on January 8. 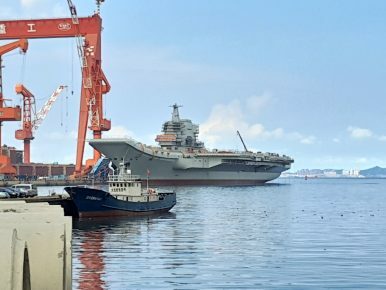 A previous round of sea trials of the carrier, previously designated Type 001A and expected to be named Shandong, took place in October in the northern Yellow Sea. This was preceded by a round of sea trials in August and September. The carrier took to the open sea for the first time in May 2018. This first round of sea trials, which took place in the northeastern part of the Bohai Sea, primarily tested the reliability of the flattop’s power and propulsion systems. The [future] Shandong will be able to carry up to 24 Shenyang J-15 multirole fighter jets and a variant of the fourth-generation Sukhoi Su-33 twin-engines air superiority fighter, as well as around ten rotary wing aircraft including Changshe Z-18, Ka-31, or Harbin Z-9 helicopters. Chinese naval officials have claimed that the carrier will be able to accommodate a total of up to 32 J-15s. Notably, the Type 002 has reportedly been fitted with a new advanced electronically scanned array (AESA) radar system and a new bridge. Once activated, the flattop will likely serve in the PLAN’s North Sea Fleet or East Sea Fleet. China’s first domestically built flattop headed out for a second round of sea trials on August 26.